You might think that a town called Sin City wouldn’t live up to its own hype. Well, Las Vegas is just as surreal as its high-reaching nickname. Everyone comes for a reason: shows, slots, clubs, shops, parties, dining, sun (but not sleep). Heteros and homos alike travel from all over the world for the fabulous, the decadent and the outrageous, which means everyone gets a little more flamboyant in Vegas. And who knows, Lady Luck may have a trick up her sleeve—or down her pants—for you. The big decision when visiting Las Vegas: to stay on the Strip or off-Strip. 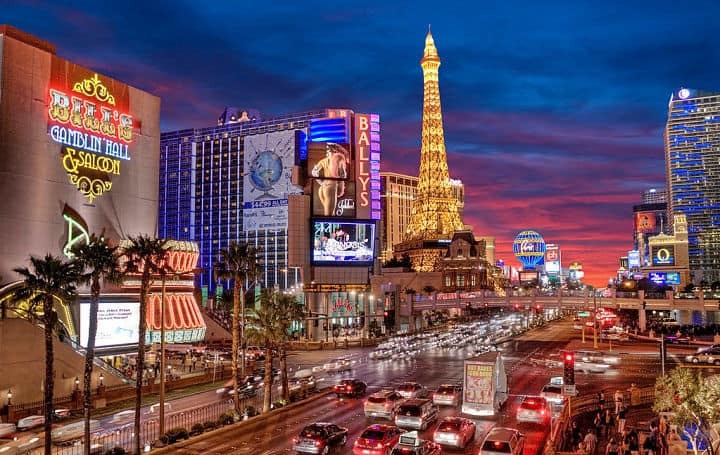 While you can save money by avoiding the Strip (Las Vegas Boulevard to you newbies), you’ll find that it contains most of what you want to do, plus all the glitz and glam you can handle. Gay hotel Blue Moon Resort is located off-Strip, and it’s also strip-off fun, making for some clothing-optional entertainment. Pool party, anyone? The Luxor also hosts an LGBT pool party every Sunday in the summer that’s not to be missed. It gets hot, so one must find a way to stay cool and hydrated while shamelessly flirting. Even though there’s a ton of mixing and mingling…and more…note that Vegas is best enjoyed with a group of friends or a significant other rather than alone. The gay nightlife is relatively subdued and small, but fun and fab nonetheless. There’s no gayborhood to speak of, so the scene is spread out. A couple highlights: The “Fruit Loop” on Paradise Road resembles a strip mall and features a cluster of gay bars and clubs, and Krave club calls the Strip home. Girls looking for girls should be on the lookout for special nights just for them. While there are just a few exclusively homo spots, stereotypically gay activities are just the norm here, making Vegas one big party for you. See real divas (not just their drag queen lookalikes), stuff yourself with shrimp, don a boa, dance all night, and go wild. It’s accepted—actually, it’s expected—and if you haven’t done at least one thing you can’t tell anyone about, you haven’t done Vegas.